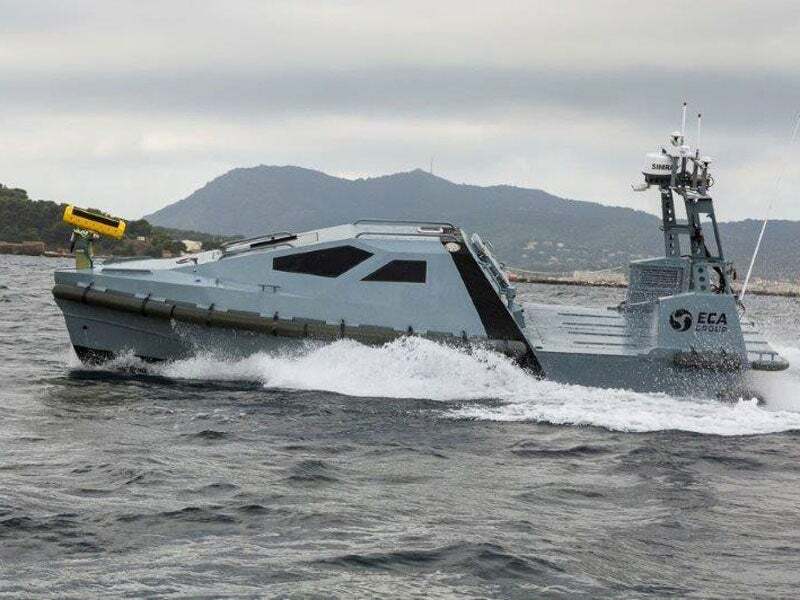 Inspector Mk2 mine-countermeasures unmanned surface vehicle (USV) is equipped with a new-generation subsea robotic system developed by ECA Group. Image courtesy of ECA Group. Inspector Mk2 mine countermeasures USV has an endurance of 12 hours at 10kt speed. Image courtesy of ECA Group. The K-Ster ROV can be operated from the Inspector Mk2 USV. Image courtesy of ECA Group. Inspector Mk2 mine countermeasures USV was demonstrated at DIMDEX 2016. Image courtesy of ECA Group. The USV can be deployed in mine countermeasures missions including mine identification, classification and neutralisation or disposal. ECA Group received a €10m export contract for the delivery of three Inspector Mk2 mine countermeasures USVs in July 2016. Deliveries are scheduled to begin by the end of 2016 and will conclude by 2018. The Inspector Mk2 incorporates an aluminium rigid hull. The ergonomic wheelhouse offers spacious and comfortable interiors, which allow manned operations. A large aft deck of the vehicle supports the installation of modular subsystem including robots or mission-specific sensors. The sonar is installed in the retractable mast for protection against shocks during transit. The modular design of the USV is easily configured to support multiple tasks. The vehicle offers high-navigation accuracy and a high level of availability, while also ensuring safe crew operations. It also reduces risks to human life and cuts procurement and operating costs. The USV has a length of 9m, width of 2.95m and a draught of 0.6m. It weighs 4,300kg in operational configuration and can carry up to 600kg of cargo / equipment on 4m² deck area. The mine countermeasures module integrated with Inspector Mk2 and associated command and control station can be easily mounted on non-countermeasures vessels such as offshore patrol vessels, frigates and combat ships. The USV is designed to support a range of robots and sensors and can deploy mine killers and inspection robots, seafloor survey sensors, lethal / non-lethal weapons, coastal protection effectors, and intelligence sensors. "The USV can be deployed in mine countermeasures missions including mine identification, classification and neutralisation or disposal." The typical mine countermeasures payload includes an interferometric sonar, a synthetic aperture sonar, a towed side scan sonar, electro-optical devices, divers, and a towed mine sweep. The USV can launch and recover a K-STER I lightweight, self-propelled, remotely operated vehicle (ROV), K-STER C mine disposal vehicle or SEASCAN MK2 ROV using a compact launch and recovery system (LARS). The K-STER I integrates a camera and high-resolution sonar to identify mines. The K-STER ROVs feature a shaped charge in a tiltable head to aim at the target for the mine disposal. The vehicles can be deployed from the inspector to perform mine countermeasures missions up to 2km from the mother ship. The USBL transducer aboard the USV enables the tracking of the ROV. The SEASCAN ROV has a maximum endurance of up to three hours and a range of 1,000m. The maximum operational depth of the ROV is 300m. The radio link aboard the USV enables the command and control of the SEASCAN and ensures the transfer of real-time sonar and video data. The operator can deploy the mine countermeasures system in autonomous or remote mode from a distant control station. The USV is fitted with two diesel engines driving a pair of waterjets. Each engine generates a maximum power output of up 300hp. The propulsion system enables a high level of manoeuvrability in adverse conditions and allows unmanned and manned operations up to sea states four and five respectively. The USV can attain a maximum speed of 35kt and operate in medium waters with a depth ranging between 10m and 100m, as well as in shallow and very shallow waters. It has an endurance of 12 hours at 10kt speed.